I'd like to introduce my first guest blogger, Priscilla from She's Cookin. Priscilla hails from Huntington Beach, California, and although she lives on the other side of the country, I have had the pleasure of meeting her in person earlier this year over delicious tapas in New York City. I just love meeting other bloggers, and this was no exception. Priscilla is a great blogger friend and I'm really thrilled that she agreed to share something here on Mission: Food. It would thus be fitting that for her travel-themed guest post Priscilla would travel to Spain and bring us this delectable Romesco sauce served with pasta and shrimp. Please enjoy!! We all have our favorite tomato-based Italian pasta sauce whether it's a quick and light Marinara sauce, robust homemade Ragu Bolognese, or the summery no-cook alla Checca with fresh tomatoes and basil, but to change it up a little, I'd like to suggest a nutty, rich-flavored Romesco sauce. The combination of roasted red peppers and nuts is a favorite of mine and one that I think everyone should add to their repertoire - plus, besides being fragrant and satisfyingly delicious, the sauce is vegan, naturally gluten-free, heart healthy, and low in sodium. Romesco is a sauce originating in Catalonia, Spain and typically made from almonds, pine nuts and/or hazelnuts, olive oil, roasted garlic, olive oil, and bitxo peppers or nyora peppers - a smaller, sweet, dried variety of red bell pepper that we commonly use. Other common ingredients include roasted tomatoes, red wine vinegar, and onion. It's a fantastic all-purpose sauce that goes well with vegetables, meat, and fish. I've tossed roasted potatoes with it, served it alongside fish, and, of course, it lends itself beautifully to pasta. Enjoying a late season harvest of tomatoes, I was inspired to recreate a Romesco sauce redolent with roasted tomatoes, similar to that of Thomas Keller's recipe in Ad Hoc At Home. 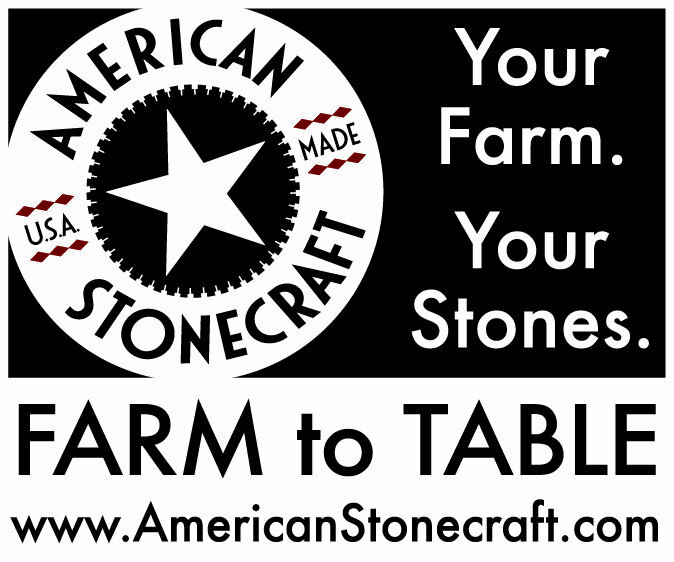 It's popularity at the dinner table, prompted another batch the following week. The first time I included red hybrid and yellow heirloom tomatoes along with an orange pepper and the second edition included all red tomatoes and green peppers from our garden - so, as always, I encourage you to take liberties, be creative - make it your own! 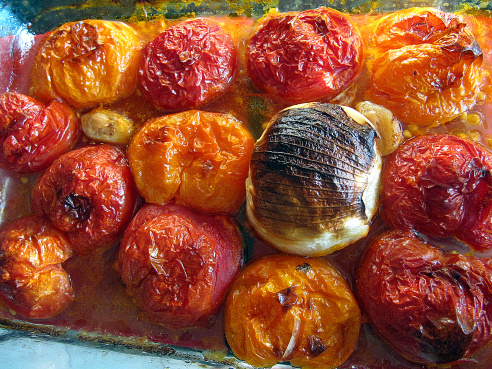 Place the tomatoes, pepper, onion, (cut side down) and garlic on a rimmed baking sheet covered with aluminum foil. Drizzle with olive oil and season with salt and pepper. Roast for about 1 hour, until the vegetables are well browned with some charring on the edges. Remove from the oven and let cool slightly. Meanwhile, heat a small pan over medium heat. Add the almonds to the pan and toast for 30 seconds to 1 minute, until fragrant. Remove the skins from the tomatoes and peppers. Remove the outer layer of the onion and coarsely chop the onion. Add the roasted vegetables, chopped onion and roasting juices to a blender or food processor and puree until smooth. Season to taste. Refrigerate in a covered container for up to 2 weeks. Prepare pasta according to package directions. 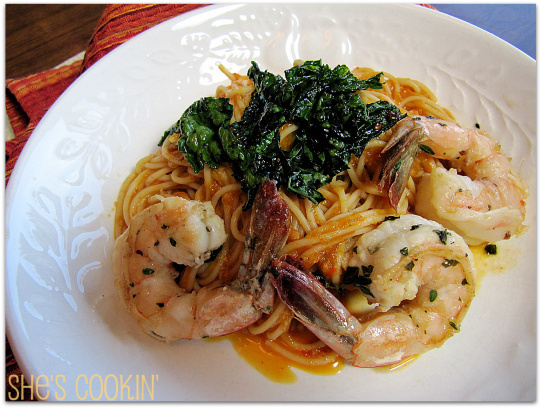 Mix with sauce and serve with shrimp and garnished with frizzled kale (directions below). For the shrimp: Marinate 1 pound of fresh shrimp (rinsed, shelled, and deveined) in the juice of 1 lemon and 2 tablespoons of extra-virgin olive oil seasoned with 1 tablespoon of fresh thyme leaves, sea salt and freshly ground pepper for 30 minutes to an hour before cooking. I quickly cooked the shrimp in the hot olive oil after the frizzled kale - turning once, 1 to 2 minutes until they're opaque in color. 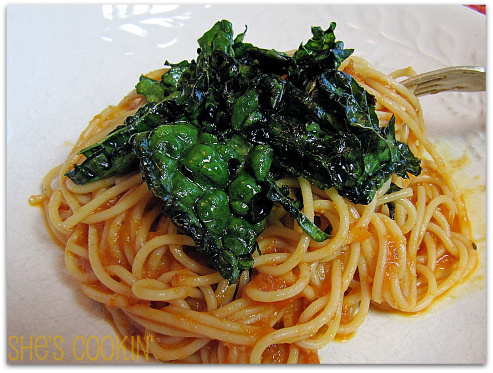 Vegan/Vegetarian option: Shown here with Barilla Plus thin spaghetti, topped with frizzled lacinato kale , also known as dinosaur kale, adding a delightful crunch and a huge amount of nutrition. I've never been a huge fan of kale, which is why I wanted to experiment with another way to prepare it other than boiled or cooked down in the southern greens fashion. After washing and removing the center rib, wrap in paper towels to dry, and tear it into bite-size pieces with your fingers. Heat about 1/2 inch of olive oil, sprinkled with red pepper flakes, to medium-high and add a handful of kale at a time to frizzle. Be careful of splattering oil from water remaining on the kale leaves.